More than 30 people attended the Greater Augusta-Fort Gordon Young Professionals’ first event of 2019. The group hosted a “First-Time Home Buyer Workshop” on Jan. 10. The event sponsors, Augusta Mortgage Co. and Meybohm Real Estate, coordinated efforts to teach young professionals the process of buying a house and how to utilize the VA loan program. The class was engaging and provided useful information for people seeking to buy their first home. “I’m really thankful that AUSA Young Professionals set up this event,” said Lajoi Sims, one of the attendees. “I plan to purchase a home in the next six months, and this workshop opened my eyes to just how much I didn’t know,” she said. 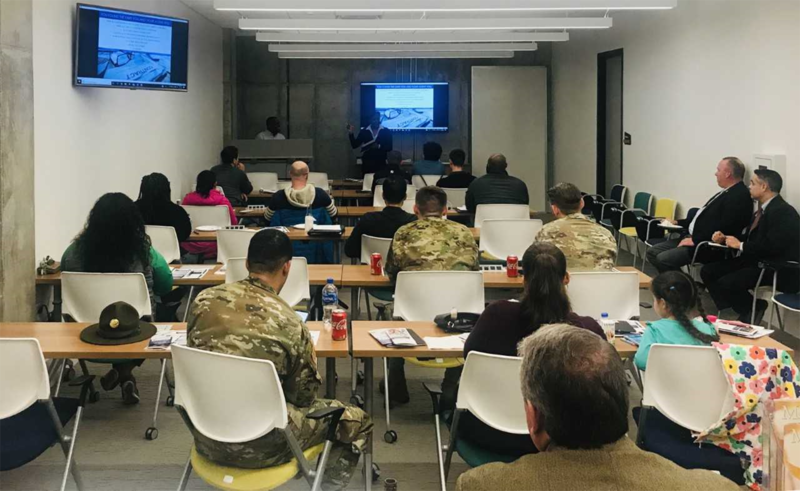 The event was well attended and was one of the group’s most successful to date, fulfilling the group’s goal to educate, develop and provide networking opportunities for young professionals in the Fort Gordon, Ga., community. This upcoming year, the AUSA Greater Augusta-Fort Gordon YP group seeks to change its strategy by mixing its social events with informative workshops to fulfill the need of professional development for the younger adult population in the area. Alejandra Miles is the AUSA Greater Augusta-Fort Gordon Chapter’s Vice President for Young Professionals.